Something simple for the coming week, because the last week was long and did not include enough naps. I grew up around the ocean. My family moved to Seattle (yes, actually Seattle, not some random suburb) the summer I turned 5 and we spent many sunny afternoons making sandcastles or skipping stones or being buried in the sand by my brothers s at Alki Beach. We visited other beaches, too--up on the coast of Washington, in Port Townsend, or sometimes we went to beaches in Oregon. I remember the lakes with less fondness. They were slimy and gross, and had too many sharp rocks. Now, it might be because I'm an introvert, or I've always had a poetic soul, or perhaps I just dreaded being pushed under the water by my brothers, but I preferred to sit in the water rather than swim. I did know how to swim, but I didn't want to. I wanted to sit, and I wanted my seat to be about a foot deep so I could be fully submerged but also feel the sandy shore. I liked to watch the water coming in and going out, I liked to feel the waves move around my body. I think I knew it felt peaceful, even though I couldn't yet appreciate peaceful things. These days I am stuck in Illinois, and there is no ocean. There is a lake. It's not horrible. My husband and I have been to the beach just twice this summer. The most recent trip was about a month ago, for our anniversary. We went at night so we could light some flying lanterns (so cool!) and watch them sail out to sea. Well... sail out to lake. (And, for the record, they didn't sail out to the lake because it was incredibly windy so they probably sailed out to the train tracks. In case you're wondering, they're biodegradable, and the entire thing burns up so if you were worried about some innocent person getting attacked by a wilted lantern, don't. Not possible.) Anyways. We lit three lanterns in honor of three years of marriage, and we would have stayed for a while except the beach closes at 9 o'clock. Joey would have been happy to hang around until the stars came out. But my favorite time to be at the beach is in the morning. So back in May we went and watched the sunrise. We woke up at 4 o'clock, despite the husband's whining, and it was absolutely breathtaking (see photo above for proof...). He wanted to leave after about five minutes, but I just wanted to sit. And so I did. One of the reasons I love the beach so much is because it's two completely different things that make one beautiful thing. You have the water, which may be fresh or salty or have lots of goose poop in it, but it's definitely water. And then you have the shore, which could be made of dirt or sand or just rocks. You put them together and BAM you have a beach. It's that simple. They are so unlike each other, sand and water. At deeper levels, they're both complicated. Sand is made out of the tiniest particles of shell and glass and rock. And that water, well it could be full of sea creatures and sunken ships, or maybe it's just a lake with lots of goose poop. 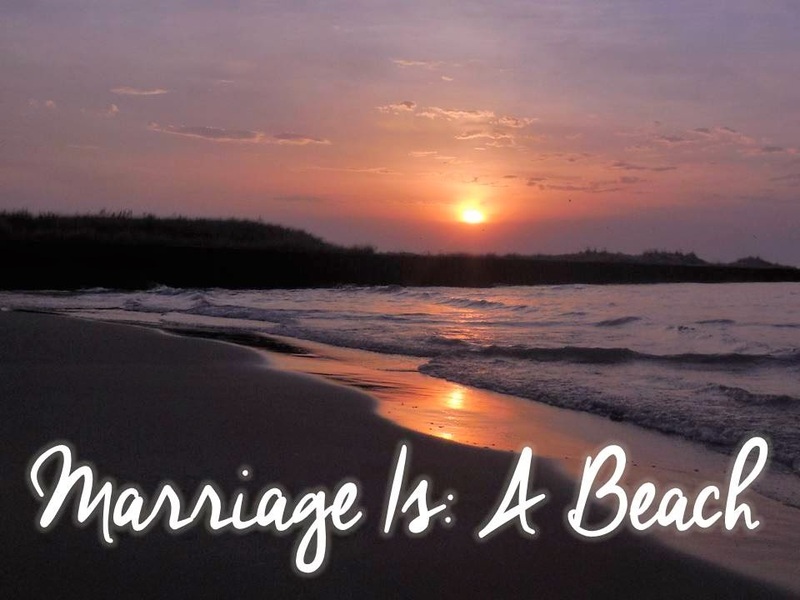 Marriage is like a beach. I know I keep making this analogy, about two completely separate things that turn into one thing, but that's really the nitty gritty truth of marriage. You take one man and one woman, you put them together and as a unit they become infinitely more awesome than they ever were apart. How fantastic is that? And how fantastic is it that a beach is just water and sand? Another important way beaches and marriages are similar is that they move. Tides of peace go out, a wave of conflict comes in. The water washes a dead fish onto the shore and then the poor sand has to deal with it. It ebbs and flows with life's changes. The sand can be too hot, the water too cold. In marriage we change as a couple, but people do still change separately--it's sad to think that for this reason people sometimes get divorced. The challenge is not how to "deal with" or "fix" the change, but how to respond in a way that is loving, and accepting. (Unless that change involves someone becoming a drug addict or getting bitten by a spider and developing super powers. You have to fix/deal with that.) Beyond time, beyond impending differences, the water and shore know that they belong together. They know their relationship is infinite, and so they make it work. How often do we forget that some of the most surreal and heartstopping things in life are not complicated? Some things just come together simply... naturally... and I find that incredible.